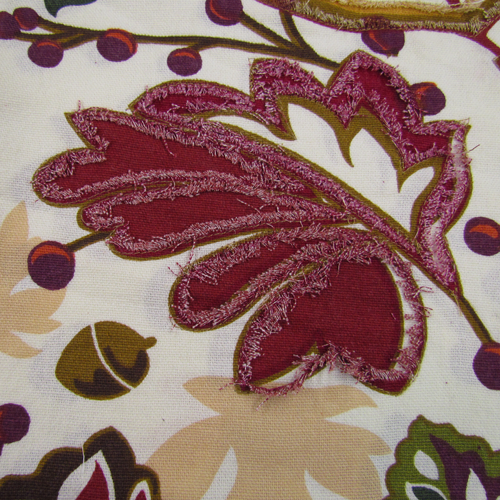 This fun project was created using an woven fabric tablecloth that was the wrong size for our new dining room table. 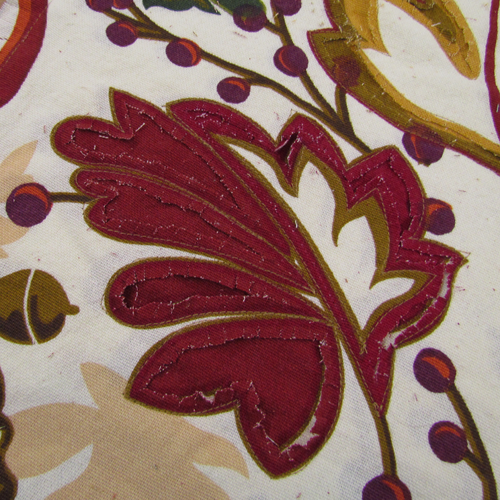 We loved the colors still and the fabric was in good shape so take a look at the amazing pillow that we created from the tablecloth! The total project took maybe 2 hours to complete. The most important part was getting the two top layers lined up exactly right. See the pictures below to follow our steps in this exciting redesign. 1. Cut two squares that are EXACTLY alike. Depending on the design of the tablecloth this may or may not be challenging. 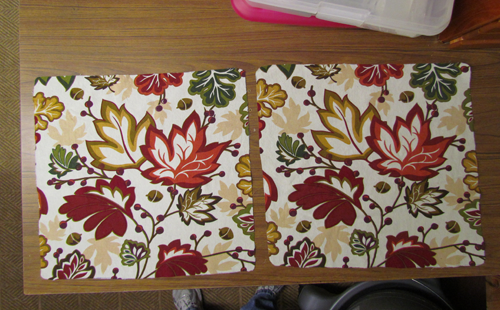 Then layer these two, one on top of the other, matching up the design exactly. 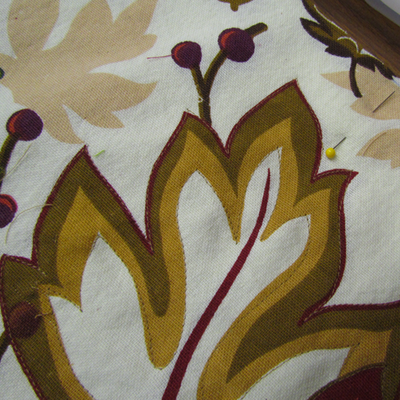 Pin very well in lots of places so that these two layers won't slide around as you stitch. 2. Choose just a few of the more prominent graphics on the fabric and stitch the outer edge of the graphic and the inner edge. 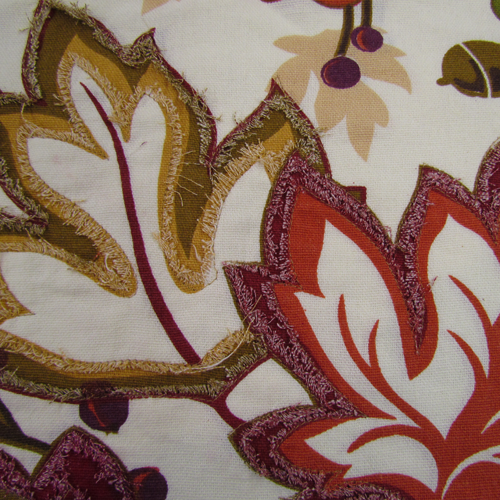 We chose to stitch around the leaves. 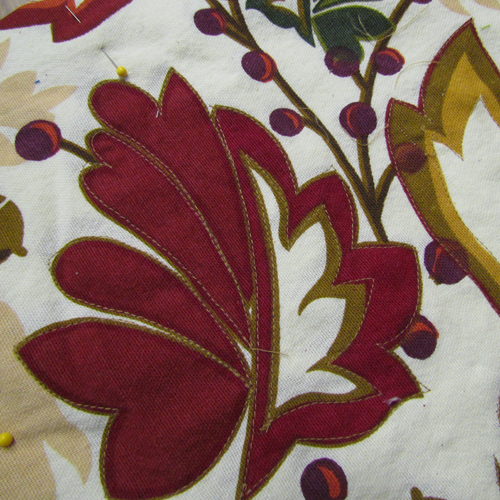 The images below will help you understand better about where to stitch. 3. 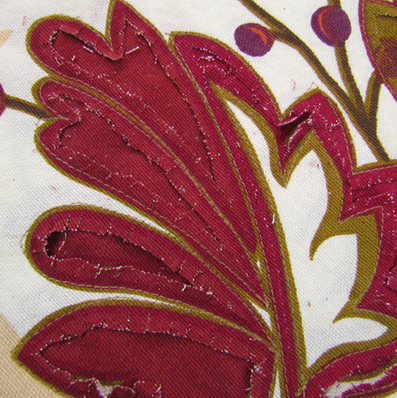 Now very carefully trim away the inner fabric of the stitched areas. Leave about 1/4 inch of allowance. 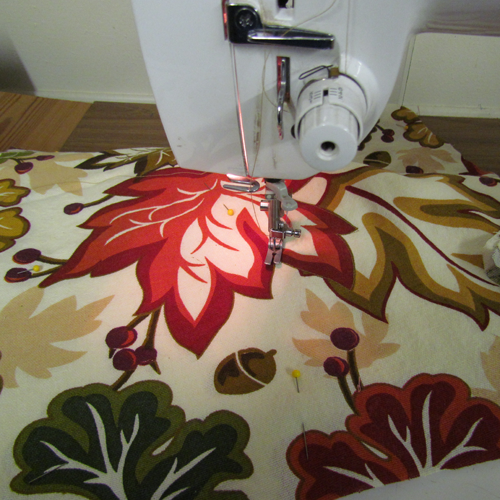 Make small clips in this allowance about 1/2 inch apart but be very careful not to clip into the stitching. 4. 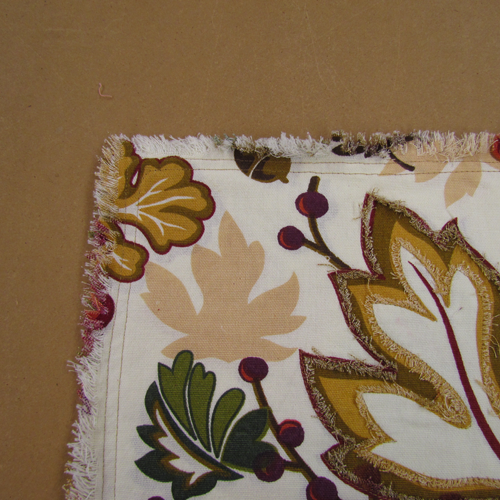 Cut another piece of tablecloth the same size for the back of the pillow. This piece doesn't need to match the design of the front. Pin the front to the back and stitch around the perimeter of the pillow about 1 inch from the edge leaving a gap open on one side to add the stuffing. Stitch again, this time about 3/4 inch from the edge. (I just did a single row in the pictures below but I added the second row after washing because I thought it looked better.) 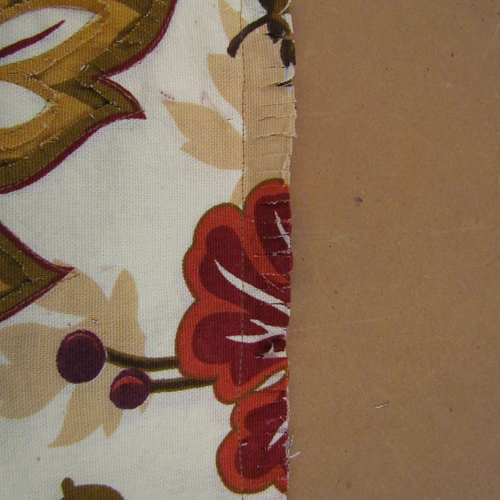 This just gives it a nice double seamed edge. Now clip all the outer edges with clips spaced about 1/2 apart. 5. Wash your unstuffed pillow in a washing machine. Use liquid fabric softener if you have it and tumble dry. When it's dry, use a lint roller to remove excess strings and press it from the back side. The images below show what the clipped edges will look like after washing. 6. Stuff your pillow nice and full and stitch up the gap. 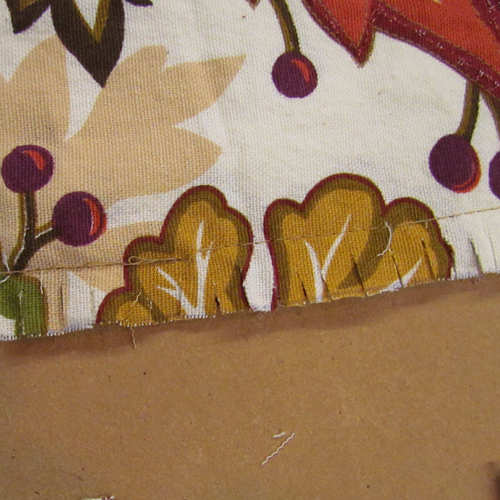 Since we're exposing all the seams to make the ragged edges, this is simple and quick. 7. Now for some fun! Add some iron on rhinestone and rhinestone embellishments to your pillow design. You can either use matching colors or contrasting colors or just use clear diamond like rhinestones depending on your pillow's colors and design. These embellishments are sold at our sister store: Jubilee Rhinestones. 8. Some people like to use specially made tools for applying these rhinestones but in the case of this pillow, I just placed them directly onto the pillow a few at a time and ironed them into place with my household iron. Just "iron as you go" and it's pretty simple. Ta Da!! 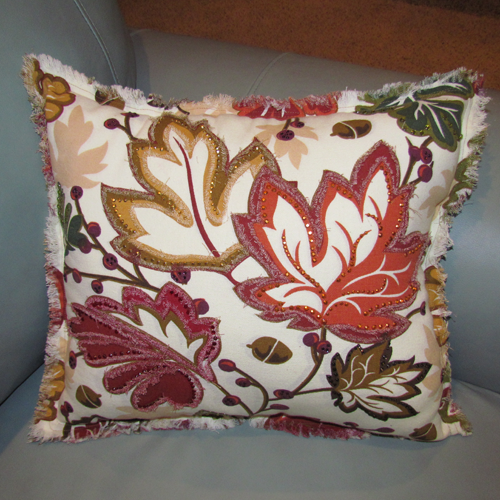 The finished redesigned pillow. 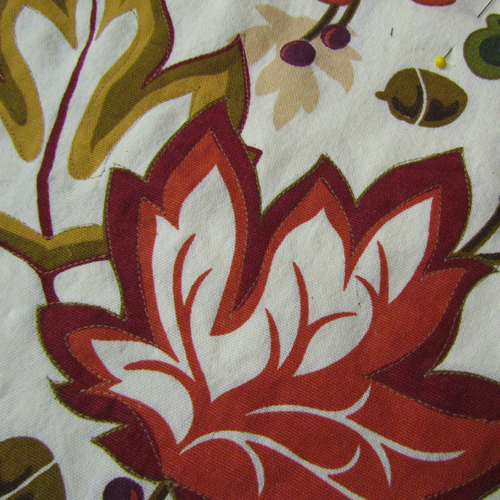 Once was a loved but unused tablecloth. Now an equally loved showpiece for my living room!